Jon Oli came all the way from Iceland to train in Krav Maga. He wanted the real deal and was willing to work hard for it. Training tirelessly for a full month, getting in as much training as he could, he gained great knowledge and expertise. His natural talent and ability to pick up techniques quickly, his previous experience and hard work, all contributed to his rapid success. He is an accredited junior instructor and I hope he will soon start teaching in Iceland. 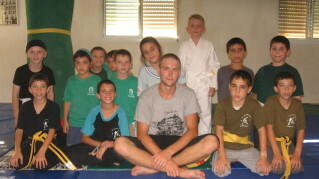 Jon Oli plans to return to Israel to continue his training in the future. He is a real asset to IKI. Hard work pays off. Jon Oli, in the middle, at shooting range in Maaleh Adumim. He scored a 95%.